© Sonohata et al. Licensee Bentham Open. Total hip arthroplasty (THA) for poliomyelitis is a problematic procedure due to difficulty in positioning the cup of the prosthesis in the true acetabulum and the risk of dislocation after THA due to the low muscle tone. We herein present a case of bilateral hip pain with a history of poliomyelitis. Radiograph showed bilateral hip osteoarthritis caused by hip dysplasia due to residual poliomyelitis in right hip joint or developing dysplasia of the hip joint in left hip joint. THA was performed to bilateral hip joints. Six years after bilateral THA, bilateral hip pain significantly improved. Additionally, the muscle strength on the paralyzed right side partially improved. However, the muscle strength on the non-paralyzed left side did not significantly improve. No complications related to the surgery were observed. Promising early results were obtained for THA in our patient with residual poliomyelitis. However, surgeons should pay attention to the potential development of complications concerning THA that may arise due to the residual poliomyelitis. Keywords: Bilateral, developing dysplasia of the hip joint, paralysis, poliomyelitis, residual poliomyelitis, total hip arthroplasty. Poliomyelitis is an important paralytic disease of childhood that is an acute infection caused by a group of neurotrophic viruses that have a special affinity for the anterior horns cells of the spinal cord and for certain motor nuclei of the brain stem. Some have asserted that the joints in the paralytic limb are protected from the development of osteoarthritis in patients with residual poliomyelitis, perhaps due to a reduction in the forces across the joint . However, in general, the frequency of hip impairment during the evolution of neuromuscular diseases depends on the intensity and spread of the palsy . When the gluteus maximus and medius muscles are paralyzed and the hip flexors and adductors are of normal strength, subluxation of the hip affected by poliomyelitis can occur , which leads to painful arthritis of the hip [4-6]. On the other hand, the almost normal contralateral hips of patients with poliomyelitis are almost protected from osteoarthritis because these patients may be less active owing to the sequelae of this condition. However, degenerative arthritis in a previously normal contralateral hip can be caused by a leg length discrepancy, pelvic obliquity, or severe deformities of the affected hip [7-9]. Therefore, an arthritic hip may be encountered in either the paralytic or normal contralateral limb. There have been only six reports regarding total hip arthroplasty (THA) in patients with residual poliomyelitis, and in all cases, THA was only performed on one side [2, 7, 13-16] (Table 1). This report describes the case of a patient with residual poliomyelitis who underwent THA for both the paralytic and non-paralytic side. Summary of a literature review on total hip arthroplasty for patients with poliomyelitis. The patient was informed that the data from this case would be submitted for publication, and she gave her consent. A 49-year-old Japanese female with a history of poliomyelitis in her right lower limb was referred to our hospital for evaluation of bilateral hip pain. She also had pain in her right knee and ankle. She could only walk with two crutches. She had undergone one surgery on her right ankle when she was four years old and another on her right hip when she was nine years old, however, she had no medical records regarding the procedures. However, the ankle surgery was not arthrodesis. A radiograph of the pelvis before the operation. (A) Anteroposterior view showings bilateral osteoarthritis of the hip joints due to residual poliomyelitis in the right hip and developmental dysplasia of the hip (DDH) in the left hip. (B) Lateral view of the right hip joint. (C) Lateral view of the left hip joint. During physical examination, the patient experienced severe pain with bilateral hip motion. The range of motion of her hip joints were 80 and 80 degrees of flexion, 30 and 30 degrees of abduction 40 and 20 degrees of external rotation, and 0 and 10 degrees of internal rotation for the right and left hip, respectively. Her muscle strength of the paralyzed right hip joint was grade 2 of 5 in hip flexor, 3 of 5 in hip abductor, 3 of 5 in hip adductor, and 2 of 5 in hip extensor. Additionally, her muscle strength of the non-paralyzed left hip joint was grade 4 of 5 in hip flexor, 4 of 5 in hip abductor, 5 of 5 in hip adductor, and 4 of 5 in hip extensor. The circumference of the thigh at 10 cm above the proximal edge of the patella was 34 cm on the right side and 44 cm on the left side, and the maximum circumference of the lower legs were 26 cm on the right and 33 cm on the left. Her right lower limb presented a shortening of 5cm. She did not have any history of therapy for the developing dysplasia of the hip joint. Radiographs demonstrated that the right hemipelvis and femur were severely hypoplastic, and the right femur had a high neck-shaft angle. However, the right femoral head was not dislocated. We were able to see the osteoarthritis in the right hip joint due to residual poliomyelitis. In the left hip joint, the radiographs also demonstrated osteoarthritis; however, this osteoarthritis was thought to be due to developmental dysplasia of the hip (DDH) (Fig. 1). Her whole right lower limb was severely hypoplastic with an obvious equinus foot (Fig. 2). The THA was planned for her symptomatic hip joints. She first underwent left THA, then underwent right THA four months later. For both THA, a posterolateral approach was used. The operations were performed using hydroxyapatite (HA)-coated cementless femoral components, HA-coated cementless acetabular shells, polyethylene liners and zirconia balls (Kyocera, Kyoto, Japan). Multihole acetabular cups were used on both sides. Five screws were used on the paralyzed right side and 2 screws were used on the non-paralyzed left side. The length of the operation time was 39 minutes for left THA and 54 minutes for right THA, and the total blood loss was 670g during left THA and 455 g during right THA. She started to move with a wheelchair two days after both operations. She had no neurological abnormalities, infections, or dislocations after THA. A radiograph of the whole lower limbs before the operation showings severe hypoplasia in the right lower limb with an obvious equinus foot and leg length discrepancy. The Japanese Orthopedic Association hip rating score (JOA hip score) increased from 41 to 71 in the left hip and from 61 to 71 in the right hip. The JOA hip score includes four categories, and 100 points as full marks: pain (40 points), range of motion (20 points), walking (20 points) and activity of daily life (20 points) . The pain score improved significantly in each hip joint. The leg length discrepancy improved from 5 cm to 3 cm. Her muscle strength of the paralyzed right hip joint improved from grade 2 to 3 of 5 in hip flexor, 3 to 4 of 5 in hip abductor, 3 to 4 of 5 in hip adductor, and 2 to 3 of 5 in hip extensor. However, the muscle strength on the non-paralyzed left side did not significantly improve. The patient’s condition was satisfactory in both of her hip joints six years after bilateral THA. However, she is only able to walk with two crutches and an ankle brace because of severe right ankle pain. The radiographs taken at the last follow-up showed apparently solid fixation of the components with no osteolysis and no migration of the cup (Fig. 3). A radiograph of the pelvis after total hip arthroplasty. (A) Anteroposterior view. (B) Lateral view of the right hip joint. (C) Lateral view of the left hip joint. Only 0.5% of patients with paralytic complications due to poliomyelitis develop permanent paralysis . Widespread vaccination has dramatically reduced the number of poliomyelitis cases . Due to these factors, few orthopaedic surgeons have experience in treating the sequelae of paralytic poliomyelitis. Survivors of this disease may present with deformities of the foot and ankle, upper extremities, and degenerative arthritis of the weight-bearing joints of either the paralyzed or non-paralyzed extremity. However, there have been only four case reports (two cases in one report) and two case series reports (comprising five cases and 10cases) [2, 7, 13-16]. Therefore, a total of only 20 cases have been reported. Patients with poliomyelitis have the potential to develop osteoarthritis of the hip joint of either the paralyzed or non-paralyzed leg. However, the cases in the previous reports all underwent unilateral THA. To our knowledge, this is the first report where a patient with residual poliomyelitis underwent bilateral THA. Patients who have neuromuscular diseases may require THA for two general reasons: either the disease process has led to dysplasia of the hip, which in turn has evolved into degenerative joint disease, or the degenerative joint disease has developed independently of the neurological condition . Our case demonstrated severe hip dysplasia and osteoarthritic changes in the paralyzed right hip joint. Fortunately, some kind of osteotomy (unknown due to the lack of medical records) performed when the patient was nine years old may have prevented the dislocation of her paralyzed right hip joint. Her non-paralyzed left hip joint also had osteoarthritis due to DDH. Hip osteoarthritis due to DDH is relatively rare. However, Jingushi et al. described a high prevalence of acetabular dysplasia in hip osteoarthritis joints in Japan, and acetabular dysplasia was one of the most important factors associated with hip osteoarthritis in Japan . Therefore, the present case had bilateral hip osteoarthritis caused by hip dysplasia due to either residual poliomyelitis or DDH. THA for patients with hip dysplasia can be associated with difficulty positioning the cup of the prosthesis in the true acetabulum . In particular, additional techniques such as multiple screws should be used on the paralyzed side with marked bone atrophy. In patients with residual poliomyelitis, there are several important problems concerning rehabilitation after THA for the paralyzed or non-paralyzed hip joint. After THA for the paralyzed hip joint, there is a risk of dislocation due to flaccid paralysis and the decreased muscle tone . Three dislocations were previously reported, and all of these were on the paralyzed side [2, 13, 15]. The rate of dislocation was calculated to be 15%. We have not observed any dislocation on either side in our case after a follow-up period of six years. After we performed THA for the non-paralyzed hip joint, we were concerned about supporting the lower extremity for gait exercise. However, it posed little problem for our case because she made good use of walking aids after surgery. We did not observe any complications related to either of the surgeries in our case. There was marked bone atrophy on the paralyzed side. However, HA-coated cementless components affected the mid-term results in the current case. Moreover, good radiographic and clinical results are expected as long-term results . A point of interest in this case is the genesis of hip osteoarthritis, which was due to residual poliomyelitis and DDH. Residual poliomyelitis affected the limb during growth and resulted in reduced muscular function, which eventually evolved into pelvic hypoplasia . DDH affected the concentration of stress from load-bearing, and the progression of joint destruction is accelerated during growth . Both hips therefore had osteoarthritis caused by dysplasia due to diverse causes. Although the decrease in the number of patients with residual poliomyelitis is expected to continue, additional case reports of other successful treatments are needed in the future to help reach a consensus regarding the optimal treatment of such patients. THA for the patients with neuromuscular diseases will become more important in the future, and the knowledge generated in residual poliomyelitis patients may be a helpful for treating such cases. Haddad FS, Masri BA, Garbuz DS, Duncan CP. Primary total replacement of the dysplastic hip. Instr Course Lect 2000; 49: 23-39. Wicart P, Barthas J, Guillaumat M. Replacement arthroplasty of paralytic hip. Apropos of 18 cases. Rev Chir Orthop Repar Appar Mot 1999; 85(6): 581-90. Lau JH, Parker JC, Hsu LC, Leong JC. Paralytic hip instability in poliomyelitis. J Bone Joint Surg Br 1986; 68(4): 528-33. Emr J. Study of surgical treatment of paralytic dislocation of the hip after poliomyelitis. Acta Chir Orthop Traumatol Cech 1959; 26(3): 233-7. Mallet J. Paralytic dislocation of the hip caused by poliomyelitis. Rev Chir Orthop Repar Appar Mot 1956; 42(1): 85-98. Valls J. Paralytic dislocation of the hip. Bull Hosp Jt Dis 1960; 21: 346-50. Cabanela ME, Weber M. Total hip arthroplasty in patients with neuromuscular disease. Instr Course Lect 2000; 49: 163-8. Delaunay CP, Bonnomet F, Clavert P, Laffargue P, Migaud H. THA using metal-on-metal articulation in active patients younger than 50 years. Clin Orthop Relat Res 2008; 466(2): 340-6. Queally JM, Abdulkarim A, Mulhall KJ. Total hip replacement in patients with neurological conditions. J Bone Joint Surg Br 2009; 91(10): 1267-73. Sonohata M, Tajima T, Kitajima M, et al. 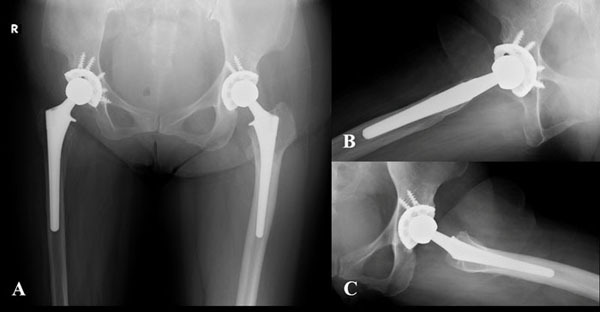 Total hip arthroplasty combined with double-chevron subtrochanteric osteotomy. J Orthop Sci 2012; 17(4): 382-9. Thompson KM, Tebbens RJ. Current polio global eradication and control policy options: perspectives from modeling and prerequisites for oral poliovirus vaccine cessation. Expert Rev Vaccines 2012; 11(4): 449-59. Yoon BH, Lee YK, Yoo JJ, Kim HJ, Koo KH. Total hip arthroplasty performed in patients with residual poliomyelitis: does it work? Clin Orthop Relat Res 2014; 472(3): 933-40. Laguna R, Barrientos J. Total hip arthroplasty in paralytic dislocation from poliomyelitis. Orthopedics 2008; 31(2): 179. Spinnickie A, Goodman SB. Dissociation of the femoral head and trunion after constrained conversion total hip arthroplasty for poliomyelitis. J Arthroplasty 2007; 22(4): 634-7. Cameron HU. Total hip replacement in a limb severely affected by paralytic poliomyelitis. Can J Surg 1995; 38(4): 386. Nakashima Y, Sato T, Yamamoto T, et al. Results at a minimum of 10 years of follow-up for AMS and PerFix HA-coated cementless total hip arthroplasty: impact of cross-linked polyethylene on implant longevity. J Orthop Sci 2013; 18(6): 962-8.